facility in Europe to service the North American market. 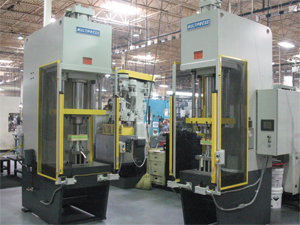 To take on the task, ZF installed a ball-joint assembly cell consisting of two hydraulic presses, from Multipress, Columbus, OH, that meet extremely tight specifications for ram-position control: ±0.0015 in. Multipress supplied custom-configured 100- and 50-ton floor-mounted C-frame presses, each featuring electronic and mechanical subsystems to ensure the specified accuracy on a consistent basis. A Delta motion controller works in concert with an Allen-Bradley PLC to divide the speed of the downward ram stroke into three stages, with maximum deceleration occurring within 0.10 in. of contact with the part. The combined action of an electronic timer and a pressure transducer determine dwell time and ram reversal, to ensure that time and pressure on the workpiece fall within preprogrammed limits. A linear transducer built into the hydraulic cylinder controls the ram contact position within the ±0.0015-in. specified tolerance. Multipress, which installed the presses in July 2008, provided other features: a touchscreen operator interface, storage of multiple recipes for various ball joint sizes and shapes, and light curtains and hard guarding for operator safety.